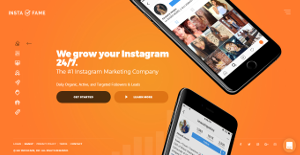 InstaFame is a marketing service platform developed specifically to boost your Instagram’s marketing reach within the Instagram social networking community. The platform caters to businesses, organizations, and freelancing professionals who look to grow their Instagram followers with daily organic, active, and targeted followers and leads. With InstaFame, you never have to do the grunt work of analyzing the leading Instagram accounts of your niche and competitors. They take care of the hard work, including targeting your competitors’ followers so you can concentrate on growing your Instagram account and use it as a launchpad and marketing tool for your products and services. InstaFame is a very friendly, intuitive service designed to exponentially widen the reach of your Instagram account and reel in followers with the best potential to convert into customers and ambassadors of your brand. It only takes five minutes to sign up with InstaFame’s custom registration and once you are in, you never have to go through your competitors’ data as InstaFame takes care of it all, providing you with thousands of organic engagements on top of tens of leads on a monthly basis. With InstaFame, building your brand and your base of followers is a breeze. You have the platform to help you manage your activity speed, target particular accounts, and enable you to build your followers, your engagement, or both. Plus, you can totally enjoy limitless variations for your comments. Tracking your followers is a walk in the park. InstaFame lets your monitor the growth of your followers’ base and provides you with graphs and charts to display your “Growth vs. Loss” from previous periods. The service also offers male versus female follower insights and show your data on a daily, weekly, and monthly display. InstaFame shows you which of your posts have the best engagement and which ones performed poorly. You can rank your posts based on your criteria as well as identify the best time and topic to further maximize the reach of your posts. All elements such as likes, comments, and shares are analyzed to help you discover more opportunities. What Problems Will InstaFame Solve? You are an upcoming musician, model, or clothing brand, looking for more exposure on the quickly expanding social media stage- but with so many illegitimate services, it’s hard to know who can deliver great results, consistently. InstaFame solves your problem by saving you time to focus on your business and content while the platform drives all the direct traffic straight to you! Online businesses of every kind are always looking for a solution to drive organic AND automatic leads- Intafame solves this issue by targeting your niche competitors, and finding their top engaging followers- then, drive those followers straight to you. With good content, you can enjoy an endless supply of high-quality customers/fans who want to know more about your business! Network marketing is one of the largest industries in the world- many network marketers use Instagram, but fail to drive traffic that will grow their organizations. InstaFame will engage with 1000’s of people who are interested in similar niches to yours, and in turn drive 10’s of direct messages each week, inquiring about your business or organization! Organizations have unique wants and requirements and no software platform can be perfect in such a situation. It is pointless to try to find a perfect out-of-the-box software app that meets all your business requirements. The intelligent thing to do would be to adapt the application for your special wants, employee skill levels, budget, and other factors. For these reasons, do not rush and subscribe to well-publicized trendy systems. Though these may be widely used, they may not be the best fit for your particular needs. Do your homework, check out each short-listed platform in detail, read a few InstaFame reviews, speak to the seller for explanations, and finally select the app that provides what you require. How Much Does InstaFame Cost? We realize that when you make a decision to buy Social Media Monitoring Software it’s important not only to see how experts evaluate it in their reviews, but also to find out if the real people and companies that buy it are actually satisfied with the product. That’s why we’ve created our behavior-based Customer Satisfaction Algorithm™ that gathers customer reviews, comments and InstaFame reviews across a wide range of social media sites. The data is then presented in an easy to digest form showing how many people had positive and negative experience with InstaFame. With that information at hand you should be equipped to make an informed buying decision that you won’t regret. What are InstaFame pricing details? What integrations are available for InstaFame? At the moment, InstaFame offers a streamlined integration with Instagram. If you need more information about InstaFame or you simply have a question let us know what you need and we’ll forward your request directly to the vendor.